Stocks tired or getting ready to flex their muscles? I spent a big part of the weekend working on the soon to be released major update to the TradeRadar software. As a result, I fell behind on the usual weekend blog posts. What follows then, is a combination of our Weekly Review and the Weekend Winners and Losers where we announce the weekend's free stock signals available at Alert HQ. We have 100 Bollinger Band Breakouts based on daily data and 396 Breakouts based on weekly data. 951 Trend Leaders, all in strong up-trends according to Aroon, MACD and DMI. We have 156 stocks that are new additions to the list and 108 that fell off the previous list. 20 Trend Busters based on daily data of which 18 are BUY signals. We also have 41 Trend Busters based on weekly data. 120 Gap Signals -- stocks with upside or downside gaps or gaps that have been closed. We see 49 downside gaps and 71 upside gaps based on daily data. We also have 69 Gap Signals based on weekly data. Though the general tone of the Alert HQ signals is still fairly bullish, there are creeping signs of slowing momentum. When we can only find two Swing BUY signals, that implies most stocks have already started trending positive. When the Trend Leaders list gets up around 1000, it often suggest a short-term top in the market is approaching. Our moving average analysis shows a similar story. In the chart below we count the number of stocks above various moving averages and count the number of moving average crossovers, as well. We scan roughly 7000 stocks and ETFs each weekend and plot the results against a chart of the SPDR S&P 500 ETF (SPY). This analysis shows that there is still room for further gains based on the fact that we are still below some of the peaks that were registered last year. On the other hand, we are now at the same level where the most recent peak was followed by a noticeable correction. In this chart the number of stocks in strong up-trends is at a high and the number of stocks in down-trends is at a low. We're seeing a strong bounce-back in this indicator as stocks recovered from the recent correction. The question, of course, is whether stocks can keep up this kind of momentum. Since we scan most of the stocks and ETFs in the market, I generally like to look at the Vanguard Total Market VIPERs (VTI) to see how performance of this ETF stacks up. In the chart below, I have three indicators that show how strongly over-bought stocks are. You can see RSI, Williams %R and Slow Stochastics are all at extremes. Can they remain at these extreme levels for much longer? They can! 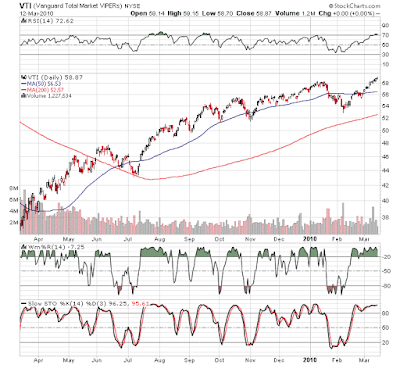 You can also see in the chart of VTI that stocks have just surpassed the January highs. This could be the beginning of another leg up. There could easily be rotation out of sectors that led the way up from the bottom of the recent correction into those sectors that have lagged. That would allow many of the statistics tracked at Alert HQ to stay at extreme levels. Decent economic performance has been supporting stocks on their way up and that dynamic could continue. Furthermore, that January high now gets to act as a support level. In the charts above, however, I've juxtaposed the S&P 500 SPDR ETF (SPY) against the data I've compiled. Our friends over at MarketClub have provided a video that reviews the S&P 500, showing how we got to where we are today and why caution is an appropriate sentiment. Watch the video now! Given how over-bought most indicators are, stocks could pause at these levels. Weakness, I think, will be brief and stocks will flex their muscles again. There's still room for more gains and the market will again show the kind of strength that has allowed ETFs like VTI to rebound to new highs.